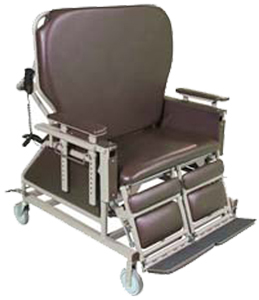 The unique CareChair adjusts from full upright sitting position to full stretcher, and everything in-between. This allows the patient to gradually adjust from supine to upright, or to be put into a supine position for treatment or emergency care. The control is a simple battery powered switch on the back, and allows infinite and gradual back positioning. The CareChair is in use in the following departments: ICU, CCU, Med-Surg, Urology, Neurology, Orthopedics, Psychiatric; and in Hospital, Long Term Care and Home settings. The CareChair is so versatile it is used in all hospital settings. Various position adjustments provide maximum patient comfort, especially for those with respiratory disorders, head and neck injuries or orthopedic problems. During an emergency the CareChair is quick and easy to convert from a chair to a stretcher making it indispensable in an ICU, CCU or emergency room. It’s comfort features and maneuverability in tight spaces make it an excellent choice when patients need to be moved in crowded high-traffic areas or must occupy the unit for a long time. The CareChair also makes perfect sense for home caregivers. Its 18-inch wide seat will fit through most home doorways. Caregivers experience no back strain when transferring a patient to and from bed to the CareChair and it reduces the number of people required to attend to a loved one. Multiple positions allow a patient to move easily from sitting upright, to lounging comfortably, to lying down. The CareChair will fit into most wheelchair-lift equipped vans giving patients greater mobility. Best of all, loved ones can be cared for at home, requiring reduced hospital stays and delaying transfer to a nursing home. Used by hospitals and medical centers around the country the CareChair is a self-contained medical transport system. When properly stocked it becomes a mobile first-aid treatment center. The CareChair contributes greatly to patient comfort and well-being. It helps prevent back injuries since patients no longer need to be lifted from their bed to a chair. And the cost savings from just one prevented back injury can cover the cost of a CareChair. Two models available, for big and bigger patients. Infinite positioning adjustments, for improved pulmonary mechanics and patient comfort. Foot and leg rests are separately adjustable. Orthopedic care and support of a casted or braced leg is possible or leg elevation to prevent venous stasis. Strategically located casters for superior stability. Will not tip! Safer for your patient and you. Easy storage with minimum footprint 33” x 38”. Adjustable height arm rests. 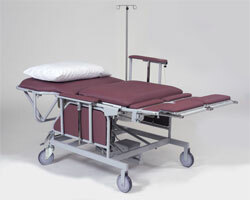 Arm rests can be adjusted to become side rails increasing patient security and comfort. They provide excellent side-to-side stability. A single locking lever provides height and position adjustments over a 10-inch range. Optional captive IV pole , oxygen tank holder, and integrated commode seat. CAMTEC puts a lot of thought into the engineering and production of all of our bariatric products. Our in-house capabilities allow us to control quality in every step of the manufacturing process. Features increase patient safety and comfort The CareChair braking system is controlled by a single lever and is available from the back or either side of the unit. This means full access with the unit in any position. All four wheels are easy to lock or unlock with a touch of the braking bar providing table-like stability or maximum freedom of movement. ROTATING PARTS. Keep fingers and arms clear of chairs moving parts when mechanism is operating. PINCH POINT. Keep objects away from these areas while chair is in motion. Use the tilt function to level the arm rest before going into the transfer (stretcher) position. Make sure that the pendant cord, if applicable, is properly positioned before operating the chair. Do not allow cord to get caught in the moving parts of the chair. Make sure I.V. Rod and oxygen tank are fully inserted into their holders. Make sure the battery charger is unplugged before moving chair. Do not place any body parts into frame while operating. Stand clear of the chairs frame before operating. The electrically controlled care chair has three controls. The power box underneath the main frame has a red handle circuit breaker mounted on the side of the box. This handle must be in the on (up) position for the unit to operate. The unit may be converted to the stretcher position (horizontal) by pushing down on the top toggle switch handle located on the back frame near the main handle. There is a slight delay between the time the switch is activated and the back moves. This is normal and should cause no concern. The unit may be converted back to the chair position by pushing up on the top toggle switch handle. The lower toggle switch (see fig 2) tilts the chair. Pushing down on the toggle switch tilts the chair back. Pushing up on the toggle switch tilts the chair forward. When the electric actuators reach their limit in either their up or down position, a mechanical ratcheting noise will be heard. This is normal and indicates the travel limit. Battery charger - a fully charged battery will support in excess of 75 complete cycles of the operation of the care chair. When the operation of the care chair slows down it is time to charge the battery. Plug the supplied charger into a 120 VAC wall socket. About 12 hours of charging will normally fully charge the battery. A good operating procedure is to charge the unit when not in use. You cannot overcharge the system by leaving the charger plugged into the unit.